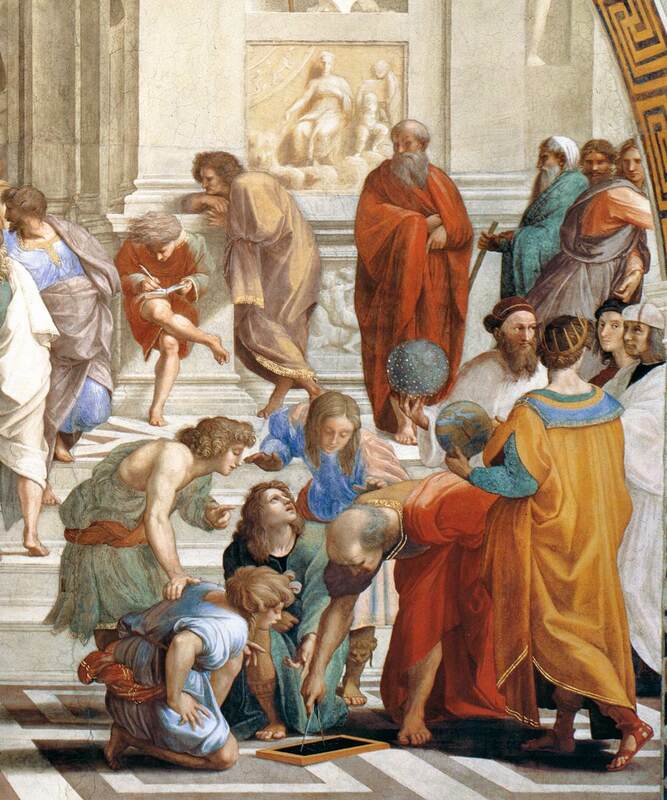 The School of Athens (detail). On the right side of the scene, Euclid is using a compass to explain a geometric problem in a drawing. Behind stands the cosmologist Ptolemy, recognizable thanks to his crown and world sphere, and the astronomer Zoroaster, who is presenting the sphere of the stars (select the image for a larger view). The "birth date" of the Project can be identified with the celebration of the Meeting for the Jubilee of the Scientists. In fact, on May 25th 2000, in the Domus Sanctae Marthae within the Vatican Walls, the representatives of the main worldwide scientific Institutions engaged in the dialogue between Science and Religion met themselves, after their participation at the Jubilee Meeting. Afterward, the International Conference Foundations and the Ontological Quest. Prospects for the New Millennium, was held at the Pontifical Lateran University on January 7-10, 2002. It was organized by the IRAFS - International Research Area on Foundations of the Sciences of the Philosophy Faculty at PUL, the Pontifical Lateran University -, in collaboration with the UIP - Université Interdisciplinaire de Paris (France) -, under the patronage of the PCC - Pontifical Council for Culture -, with the support of the JTF, John Templeton Foundation. The success of this Conference gave some of the organizers - namely Gianfranco Basti and Antonio Luigi Perrone of IRAFS and Jean Staune from UIP - the occasion for studying with Cardinal Paul Poupard how to prosecute along the direction opened by this event. It indeed demonstrated to some of the most important scientists from all over the world the openness of the Roman Pontifical Universities to a serious dialogue with the world of scientists. Gianfranco Basti, Antonio Luigi Perrone, and Jean Staune, with Melchor Sanchez de Toca of PCC, were thus charged by Cardinal Paul Poupard, at that time President of PCC, to involve some Roman Pontifical Universities in the STOQ Project. So, the STOQ Project, leaded by the Cardinal Paul Poupard involved in its First and Second Editions (STOQ I-II, 2003-6) three Pontifical Roman Universities, Lateran, Gregorian and the Athenaeum Regina Apostolorum. They are the two more ancient ones (Gregorian and Lateran) and the most recent one (Regina Apostolorum) among the Pontifical Universities, so to embrace ideally all the others, which will be progressively invited to join the STOQ Project, so to reach in the Third and Fourth Editions of the Project (2006-) the complex number of seven, with the progressive involvement of the Angelicum, the Salesian, the Holy Crossand the UrbanianUniversities. The relevance of this Project is strictly related to the particular role that the Pontifical Roman Universities play in the education of the larger part of the future leaders in education and administration of the Catholic Church all over the world, both at the level of the local Dioceses in the five continents, and at the level of the Pontifical Institutions. The strategic relevance of the STOQ Project for the Science-Religion dialogue can be thus summarized from three complementary perspectives: 1) as to the rest of the world; 2) as to the Catholic world. The STOQ Project constitutes, in the visionary perspective of its creators, a sort of "catalyst" for a wider process. This process is devoted to stress in all the countries and cultural environments where Catholics are present, the centrality of the Science-Religion dialogue for a favourable and peaceful future of the whole mankind. 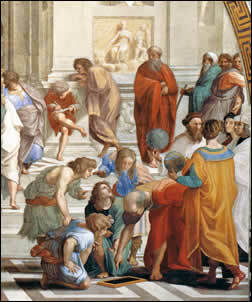 In this sense the international relationships that the Universities of the STOQ Project, as well as the Pontifical Council for Culture, already have established with other academic, private and public, national and international, educational and research institutions, all over the world, constitutes the right start point for such a process. The international promotion on the media of the initiatives and of the results of the STOQ Project is the other component for making effective the visibility of the project as to the rest of the world. In fact, no durable and effective change in the Catholic world as to the Science-Religion relationship can be imagined, without starting from its educational institutions. All the Pontifical Roman Universities involved in STOQ: a) directly, through the more than ten thousands students sent every year to them for earning their degrees from all the Dioceses of the world; and b) indirectly through the many hundreds of Academic and Educational Institutions affiliated to them all over the world - are the essential “start key” to launch such a process. All the Institutions involved in the STOQ Project share, within the common Christian faith, some basic ideas as to the role of Science in its relationship with Religion. That Science should serve the cause of the progress and of the humanity, in the whole sense of these two terms. That the human destiny in the universe is the most important quest, and to clarify this point is the ultimate goal not only of Religion, but also of Science, in their unending search for truth. Humans are indeed a part of the universe, and the universe receives its sense by the presence of intelligent agents in it, such as humans are, for a precise willing of God, the Creator. The project is thus deeply embedded in this framework, recently and authoritatively brought newly to the attention of all mankind by two Encyclical Letters of the Pope John Paul II: " Veritatis Splendor" (The Splendour of Truth, 1993) and "Fides et Ratio" (Faith and Reason, 1998). The Veritatis splendor [§ 1] affirms that in the depths of the human heart «there always remains a yearning for absolute truth and a thirst to attain full knowledge of it. This is eloquently proved by man's tireless search for knowledge in all fields. It is proved even more by his search for the meaning of life». The other encyclical letter, "Fides et Ratio" [§ 1], stresses from the beginning that «the fundamental questions which pervade human life [are]: Who am I? Where have I come from and where am I going? Why is there evil? What is there after this life?». The first of these rules is that reason must realize that human knowledge is a journey which allows no rest. The second rule stems from the awareness that such a path is not for the proud who think that everything is the fruit of personal conquest. A third rule is grounded in the "fear of God" whose transcendent sovereignty and provident love in the governance of the world reason must recognize. «All human beings desire to know and truth is the proper object of this desire. Everyday life shows how concerned each of us is to discover for ourselves, beyond mere opinions, how things really are. Within visible creation, man is the only creature who not only is capable of knowing but who knows that he knows, and is therefore interested in the real truth of what he perceives. [...] It is rightly claimed that persons have reached adulthood when they can distinguish independently between truth and falsehood, making up their own minds about the objective reality of things. This is what has driven so many enquiries, especially in the scientific field, which in recent centuries have produced important results, leading to genuine progress for all humanity». To sum up, the final goal of the STOQ Project is to contribute to the advancement of Science, to the reinforcement of the connections between Science, Philosophy and Theology, in order to testify that the ultimate finality of science is humanity and its whole welfare, of which essential components are the intellectual, the ethical and the religious elevation of each human person. Visit the sites of the different editions of the STOQ Project, by using the IRAFS II menu on the left.